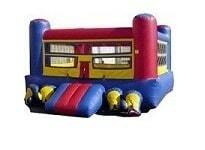 Enjoy the thrill of boxing at any event with this AWESOME inflatable boxing ring jumper. Great fun for the participants and the onlookers! Includes 2 pairs of GIANT gloves and headgear. Minimum space: 19'L x 17'W x 10'H.